IAQSource.com > Articles > What is a dryer booster fan and what does it do? What is a dryer booster fan and what does it do? When it comes to ducting dryers - the perfect solution is to run the dryer duct right out out the wall behind the dryer. We are talking about a duct run of 1 foot or less. The reality which contractors and homeowners have to work with is far from perfect. A short dryer duct length is not always possible. This is where dryer booster fans can help. A booster fan will help your dryer run efficiently and help your clothes dry quicker - saving energy. How do dryer booster fans work? Dryer booster fans help boost airflow through the dryer duct. They can be switched either with a pressure switch or via a current sensing relay. 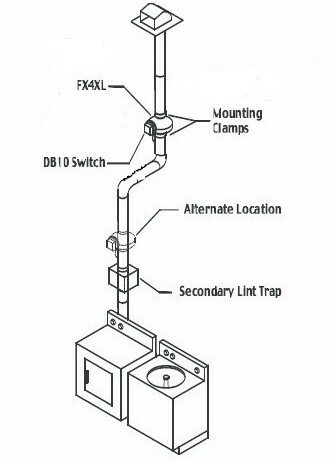 A pressure switch senses pressure in the dryer duct run and allows power to flow to the fan. A current sensing relay senses electricity flowing to the dryer and as a result - it allows power to flow to the fan. Don't use flexible vinyl or rigid PVC pipe - both can't handle the high temperatures that dryers produce. If possible, avoid using flexible ductwork as it may be ribbed. The ribbed surface can collect lint and restrict airflow. The best option is rigid galvanized or aluminum pipe. Rigid pipe and fittings are fireproof and have smooth walls, so lint is less likely to build up. If you are running your dryer duct through an unconditioned space, make sure you wrap it in insulation. If the duct stays warm, it will be less likely to form condensation and collect lint. Do I need a lint trap? If you are placing your duct booster fan closer than 15 feet from the back of the dryer - you may need a lint trap. A fan that is close to the dryer may be powerful enough to pull lint into the fan body, which could cause clogging. In this case, use the Fantech DBLT4 lint trap. The lint trap must be installed so that it is easily accessible for cleaning. Normally, the DBLT4 is installed in the dryer duct just above the dryer. The Tjernlund LB1 uses special "lint blitzing" design that makes clogs unlikely, even if the fan is installed close to the dryer. So, if you are building or remodeling a home, and your dryer duct run is long - or if your existing dryer is not getting your clothes dry in a timely fashion - a dryer booster fan may be what you need.